Behind the scenes here at Counterfeit Kit, we have a whole cast of characters. First and foremost, we have Bethany, the creator of CKC and our provider of kit inspiration and challenges each month. Next, there's Lisa who helps coordinate the team with weekly behind-the-scenes questions on our Master Forgers Facebook page to keep us interacting and charges us with special Master Forger-Only challenges - like the one we will share with you today. 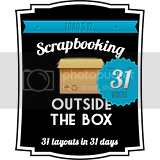 Even though our relationship is just online, we try to connect and interact to bring you the BEST scrapbooking challenge site. It is quite amazing how we all work together on the world wide web to make all of this happen. Speaking of the world, that brings us to the topic I chose for the Team Challenge. Lisa found some darling printables on Pinterest by Allison Kimball. Many are project life card sized and are "Thankful" themed. To add to the cuteness, they have that oh-so-trendy coloring book vibe to them. I had my eye on several and was attempting to print them off when a happy accident occurred. The design I chose printed out full size and inspiration struck! I knew this globe would be the perfect opportunity to document another photo from my lovely visit with Lisa. While not a requirement, using a KIT is always welcomed at Counterfeit Kit Challenge. Most of these supplies are from my March 2015 "Orange Crush" kit. Yes...it is still hanging around my scrap room! I knew it would come in handy, eventually! LOL! I did an informal cut around the globe, leaving a bit of a white border and used watercolors to color in the graphic. Nothing neat or fancy here in technique as the sketch feel of the printable allows for a causal look. While not in the original "Orange Crush" kit, how could I not include the German flair expressing gratitude acquired at Lisa's beloved "Scrapabilly" shop in Deutschland! I'm not always a doodler on my layouts, but a bit of pen sketch seemed like a must to finish off the edges. What an exciting time! I'm thankful for Lisa, the whole team and our members who keep us motivated to create and share. Now it's your turn to use these printables to express your gratitude. 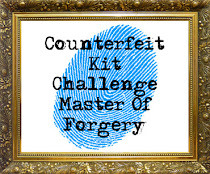 Hop along to all the Master Forgers participating in this fun activity. It will be sure to fill you with gratitude! Super cute layout, Lynnette. Just look at the two of you. Very fun! I love that you cut out the thankful word-I printed all of the printables, and didn't even think about cutting them up! Thanks for the inspiration! The doodled edge is the perfect touch! Mounting this on the kraft paper really highlights your wood accents. I love all the doodly bits! And especially love the German flair. The flying airplane just spreads the rainbow & adds so much motion. You've really succeeded with the color scheme, too. Amazingly wonderful! I would have never considered doing this. I adore the papers and accents you chose. Thank you for your kind words! So whimsical and fun! The doodles and watercolors are great and that rainbow plane is perfect and I really like the stitching too. This is such a perfect thing to scrap during the team challenge! Lisa is such an amazing member of the team - and I'm sure it was fun to meet her! Great layout! Wundabar! Such a serendipitous situation with the misprint. And that plane arcing across the blue, is the perfect addition. Lovely work. This layout tells a story. Great design and so fun. I'm blushing and grinning at the same time. You are most definitely in there on my chart - one of those L's! This is surely a perfect layout for the two of us with all that symbolism and just so much fun. 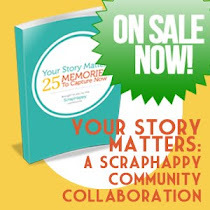 How could I not love your happy accident, the map paper, the Scrapabilly flair, the airplane, the cute photo of the two of us, your sweet words and your fun colouring! How could I not adore it?!? Thanks so much for joining in and for your loving words! How is it that my comment isnt here? I just know and remember that I commented - a little late to be honest (28th) but I went through the whole blog hop and commented :-( that makes me sad now as if I hadn't even noticed this fabulous layout. I distinctly remember commenting how touched I was and how perfect everything was that you'd added to your page from the globe right through to the Scrapabilly flair. Bleh! Maybe I didnt save it before moving on... Anyway, I really DO love this page. It's just adorable and I really DO love that you featured me and our time together. What a special time that was. We still need to fully exchange photos btw. Glad to have you in my life - a perfect layout!